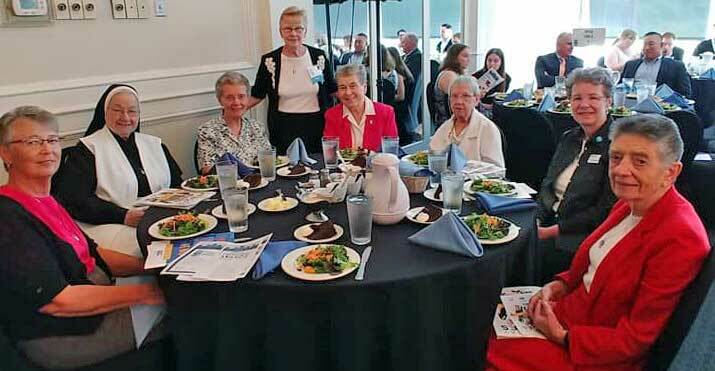 Dominican Sisters of Peace join Sr. Nadine Buchanan at the Everyday Heroes luncheon, from left: Sr. Carol Gaeke, OP; Sr. Mary Edmund Gibson, OP; Sr. Christine McManus, OP; STANDING, Sr. Nadine Buchanan, OP, Sr. Michelle Sherliza, OP; Sr. Melita Bearinger, OP; Sr. Barbara Kane, OP; Sr. Louis Mary Passeri, OP. COLUMBUS, OH – In his April, 2018 apostolic exhortation Gaudete et Exsultate, Pope Francis called them the “saints next door….” those who, unrecognized and unsung, work to help their neighbors and better their communities. On Tuesday, September 17, 25 of these “saints next door” were honored as “Everyday Heroes” by the Dispatch Media Group in Columbus, OH. Among those everyday heroes was Sister Nadine Buchanan, a Dominican Sister of Peace who lives at the Columbus Motherhouse. 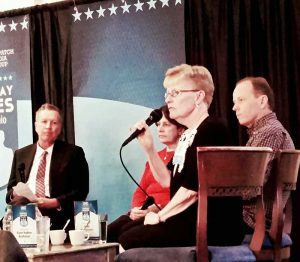 Sr. Nadine Buchanan answers the question, “What drives your ministry?” while Ohio Governor John Kasich (left), and fellow finalists Rachael Muha and Brad Hutchinson look on. Click here to view Sr. Nadine’s Dispatch magazine’s profile, and click here to view a video outlining her ministry.